The lighter evenings are a boon for runners – like my sister and nephew, who are training for their first 10k charity run. In fact, virtually anywhere in the body can be affected if it is in some way vulnerable to the extra stress. Some cushioning is important if you are running on hard urban surfaces like pavements, especially if you have cartilage wear and tear or other issues. Running shops can also help you to choose a shoe to help compensate for weak arches or flat feet, for example, and to better align ankles and knees. However, too much cushioning may do as much harm as good. 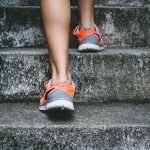 By reducing feedback from the ground it can encourage a jarring, unresponsive gait, rather than enlivening the deep muscles we need to maintain a healthy lift and space through our joints. Excitingly, from a postural point of view, there is a lot that you can do to improve your running style. With correct posture, the most vital muscles of propulsion, including those of the foot-soles and buttocks, learn their full role. These are the very same muscles we should use in our everyday walking. Also, with the pelvis well positioned, tight hamstrings, calves and hip flexors can gradually regain their natural elasticity, while the spine can bring lightness and stability to the upper body. Conversely, distorted standing and walking habits are detrimental to your running, reducing efficiency and increasing your risk of injury. Doesn’t it make sense to ‘train’ your body every day by walking well? These principles are brilliantly set out in Esther Gokhale’s book, ‘8 Steps to a Pain-Free Back’.